Understanding the motivation for a customer is not simple. This was made personal for me, in a conversation with my son this week. We have started using an ‘order online, deliver planned meals to your doorstep’ type service, and he was asking me if he could have some control over selection of meals. Nope. That’s not how it goes, the whole point is that someone else makes that decision for you. “Why do you think I like that idea?” and he had a bunch of great answers about why I might like that idea, from time saving, money saving, faster cooking the whole gamut. But he missed the pain point for me. It’s possibly too much, to expect that an organisation, and those who work there, are going to understand my reason for choosing their service, but what they can focus on is giving me the choice in that service. That’s the simple bit. So, to create the frictionless customer path (or paths) that are expected, we need to embrace the difficult behind the scenes. 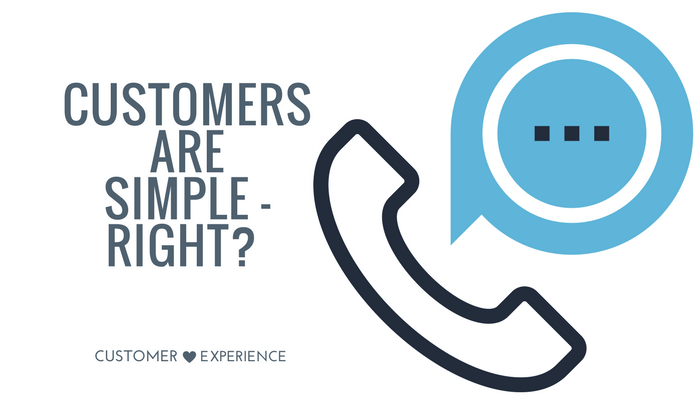 Customers expect simple (and, dare I say, quick) interaction and problems solved without having to sit on hold or be transferred around an organisation. They don’t expect to have to know or navigate the back-end processes of your business, analyse transactions or have to explain themselves multiple times. To do this, we must, behind the scenes embrace the difficult, as automation and self-service options solve more of the simple problems, the customer service team must be better equipped to deal with complex issues. We need customer service team members who can think on their feet, solve the problem for the customer and transmit the confidence that the best possible solution has been found. Too often we fall well short of this. Across the internet there appears to be consensus that there’s an “increasing need for retailers to connect the customer experience across all consumer touch points effectively and seamlessly.” That’s one of those ‘easy to say, hard to do’ kind of statements. It’s well-known that 91% of unhappy customers will never purchase services from you again (that’s right, never!) The more I absorb about the future of retail, the more complex it seems. Take Amazon go, it’s been years of research and development creating a frictionless, ‘simple’ version of grocery shopping, where the store associates may even have time to serve you. Look under the hood though, and there’s nothing simple about it. The patent diagrams look pretty complicated to me. I’m sure there’s more testing and tweaking to go in this evolution of the future store. And that’s the point, creating simplicity takes years of hard work (and sometimes a patent or two) and it’s work that requires persistence. 91% of unhappy customers will never purchase services from you again. 70% of complaining customers will do business with you again if you resolve the complaint in their favour. So, time to get that customer feedback loop into action and solve customer problems! How can you improve your systems and team training to better serve your customers? Keep persisting, there’s years of effort in making something look simple. We work with businesses to improve systems and processes and deliver change projects. We are always focused on #betterretailing, whether it’s for the end customer or customer service teams. Feel free to reach out on leoniem(at)6R(dot)com(dot)au to chat more.